Marva Dawn offers biblically grounded, experience-based insights to help churches navigate beyond today’s destructive worship wars and to stimulate renewal in the worship and life of congregations. The first major section of the book examines the postmodern, media-saturated, consumerist culture that makes worship difficult yet absolutely essential. The next section focuses on keeping God at the center of worship. Other sections of the book explore issues of taste, forming faith in children, word choices, hospitality in worship, and the challenges of “being church for the world.” The book also includes nine Scripture-based sermons and questions for further discussion. In contrast to writers who advocate worship for utilitarian purposes, Dawn concentrates on worship’s royal dimension, its God-ward focus. 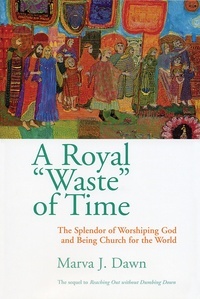 A Royal “Waste” of Time amplifies Dawn’s earlier argument that churches need to wrangle seriously with the true purpose of worship in order to employ the tools and forms that best enfold participants in the splendor of worshiping God. Only worship filled with the splendor of God, Dawn writes, will lead to genuine adoration of God and faithful formation of his people.